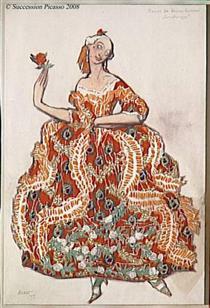 Leon Bakst produced lavish sets and costumes for the ballet stage. After graduating secondary school, he traveled to St. Petersburg to study at the St. Petersburg Academy of Arts as an unenrolled student, working as a book illustrator to support himself. 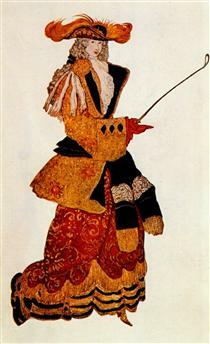 In order to help pay the bills, he also taught art to the children of Grand Duke Vladimir. 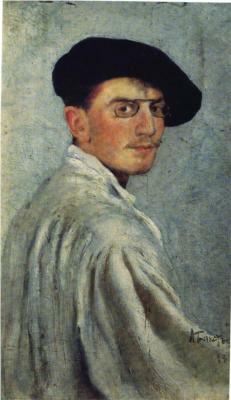 At his first exhibition, in 1889, he changed his surname, Rosenberg, which he was concerned would sound too Jewish and bad for business, to a shorter version of his mother’s maiden name Baxter: Bakst. He began exhibiting in the 1890’s with the Society of Watercolorists, as he continued his studies at the Academie Julian, making important connections with prominent artists. 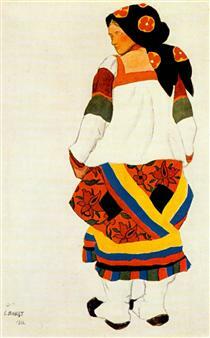 In the late 1890’s he founded, along with Sergei Diaghilev, the Mir Iskusstva, or “World of Art,” movement. He illustrated many graphics for their publication, drawing him praise and popularity. Until the end of the century, he continued to paint and receive commissions, from as high up as Tsar Nichols II himself. 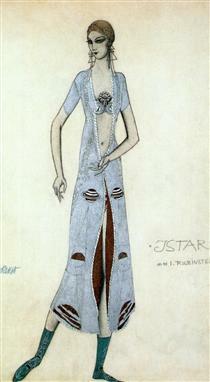 By 1909, he was mainly producing stage and costume designs, at first for Greek tragedies and then with Diaghilev’s Ballet Russes, a prominent ballerina group. Due to his Jewish religion, he was exiled from living in St. Petersburg, and was prohibited from living anywhere outside the pale of settlement, and so mainly resided in Western Europe. 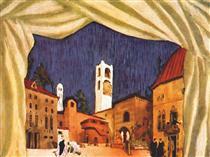 His set designs, along with those of Alexandre Benois, are recognized as revolutionizing stage design. 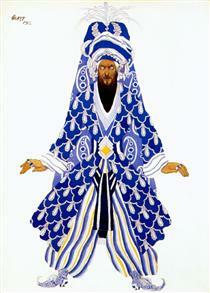 Bakst died in 1924 of lung problems, having broken with the Ballet Russes and Diaghilev in 1918, although he continued to paint. 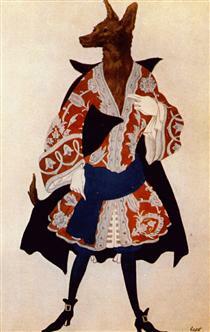 Léon Bakst (Russian: Леон (Лев) Николаевич Бакст, Leon (Lev) Nikolaevich Bakst) – born as Leyb-Khaim Izrailevich (later Samoylovich) Rosenberg, Лейб-Хаим Израилевич (Самойлович) Розенберг (27 January (8 February) 1866 – 28 December 1924) was a Russian painter and scene and costume designer. 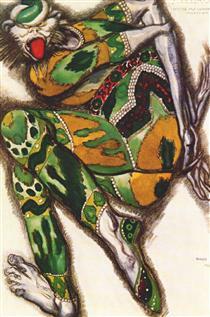 He was a member of the Sergei Diaghilev circle and the Ballets Russes, for which he designed exotic, richly coloured sets and costumes. Leyb-Khaim Izrailevich (later Samoylovich) Rosenberg was born in Grodno (now in Belarus), into a middle-class Jewish family. As his grandfather was an exceptional tailor, the Tsar gave him a very good position, and he had a huge and wonderful house in Saint Petersburg. Later, when Leyb's parents moved to the capital, the boy Leyb would visit his grandfather's house every Saturday. He said that he had been very impressed as a youth by that house, always returning with pleasure. At the young age of twelve, Lejb won a drawing contest and decided to become a painter, but his parents did not approve of this. After graduating from gymnasium, he studied at the St. Petersburg Academy of Arts as a noncredit student, because he had failed the entry. 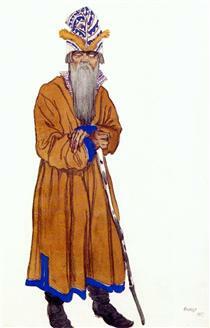 He also worked part-time as a book illustrator, gaining admission into the Imperial Academy in 1883. 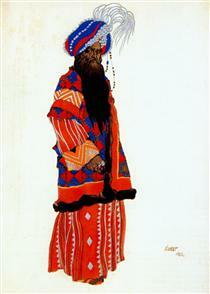 At the time of his first exhibition (1889) he took the surname of "Bakst," based on his mother's maiden name. The surname "Rosenberg" was thought to be "too Jewish" and not good for business. 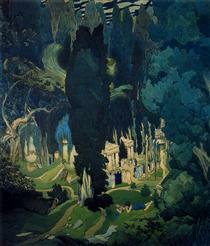 At the beginning of the 1890s, Bakst exhibited his works with the Society of Watercolourists. From 1893 to 1897 he lived in Paris, where he studied at the Académie Julian. He still often visited Saint Petersburg. 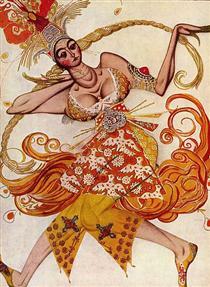 After the mid-1890s, Bakst became a member of the circle of writers and artists formed by Sergei Diaghilev and Alexandre Benois, who in 1899 founded the influential periodical Mir iskusstva, meaning "World of Art." His graphics for this publication brought him fame. 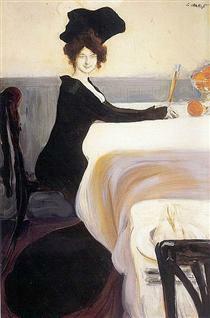 Bakst continued painting, producing portraits of Filipp Malyavin (1899), Vasily Rozanov (1901), Andrei Bely (1905), Zinaida Gippius (1906). 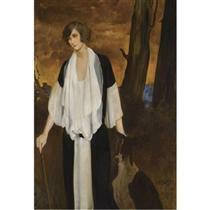 He also worked as an art teacher for the children of Grand Duke Vladimir Alexandrovich of Russia. In 1902, he took a commission from Tsar Nicholas II to paint Admiral Avellan and Russian sailors meeting in Paris, a painting he started there, during the celebrations from the 17 to 25 October 1893. However, it took him 8 years to finish this work. In 1898, he showed his works in the Diaghilev-organized First Exhibition of Russian and Finnish Artists; in World of Art exhibitions, as well as the Munich Secession, exhibitions of the Union of Russian Artists, etc. 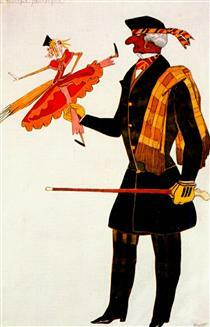 During the Russian Revolution of 1905, Bakst worked for the magazines Zhupel, Adskaja Pochta, and Satyricon, then for an art magazine called Apollon. 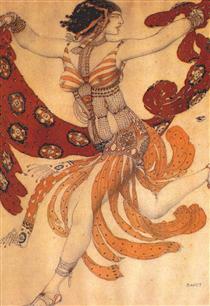 Beginning in 1909, Bakst worked mostly as a stage-designer, designing sets for Greek tragedies. 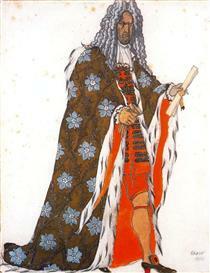 In 1908, he gained attention as a scene-painter for Diaghilev with the Ballets Russes. He produced scenery for Cleopatra (1909), Scheherazade (1910), Carnaval (1910), Narcisse (1911), Le Spectre de la Rose (1911), L'après-midi d'un faune (1912) and Daphnis et Chloé (1912). During this time, Bakst lived in western Europe because, as a Jew, he did not have the right to live permanently outside the Pale of Settlement in the Russian Empire.